As food retailers and manufacturers sign a pledge to cut saturated fat levels in their products, how much do you know about the different types of fat in your diet? Apart from saturated fat, others found naturally and artificially in food are unsaturated fat and trans fats. Not all fat is bad – a little in your diet helps the body absorb certain nutrients. And fat can be a source of energy, also providing essential fatty acids and some vitamins – such as vitamins A and D.
So which fats should you be eating more of and which should you look to reduce? According to NHS Choices – an online healthcare advice service – cutting down on foods that are high in saturated fat is important as part of a healthy diet. Such foods include, butter, lard, chocolate, cakes, pastries and meat products, including sausages and pies. 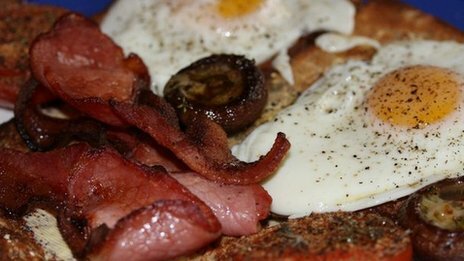 Most people eat too much saturated fat: around 20% more than the recommended maximum, studies by the British Dietetic Association say. Current Department of Health daily recommendations say the average man should eat no more than 30g of saturated fat a day, while the average woman should eat no more than 20g a day. A diet high in saturated fat can increase low-density lipoprotein cholesterol levels (otherwise known as bad cholesterol) in blood over time, increasing the risk of heart disease. But that risk has recently been disputed. Writing in the British Medical Journal, cardiologist Dr Aseem Malhotra says saturated fat has been “demonised for decades” with any link to heart disease not fully supported by scientific evidence. He says the food industry has compensated for lowering saturated fat levels by replacing them with sugar. Eating a diet of unsaturated fats can help lower bad cholesterol levels in the blood and increase levels of high-density lipoproteins (known as good cholesterol). 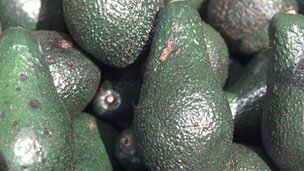 It also recommends a small amount of monounsaturated fats to help maintain healthy cholesterol levels. The third type of fat that can be found in the diet, is trans fats. It can be used for frying. 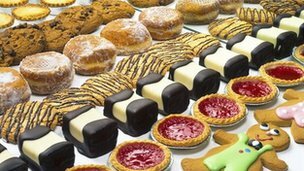 Artificial trans fats can also be found in some processed foods, such as biscuits and cakes, and are sometimes used to give products a longer shelf life. A diet high in trans fats can also lead to high levels of bad cholesterol in the blood, but most people in the UK do not eat a lot of trans fats. On average, we eat about half the recommended maximum. Most UK supermarkets have removed hydrogenated vegetable oil from their products. NHS Choices says we eat a lot more saturated fats than trans fats, but says reducing the amount of saturated fat is more important than reducing the amount of trans fats. Sources: Department of Health, British Heart Foundation, NHS Choices and NHS Fat Facts. also Listen to the hottest radio. This entry was tagged British Dietetic Association, British Heart Foundation, diabetes, diet, fat, food, Hydrogenation, Low-density lipoprotein, National Health Service (England), NHS, over, radio, radio 2hot, Trans fat, Unsaturated fat, weight. Bookmark the permalink.